Although Oahu is a fairly expensive Hawaiian island when it comes to hotels, it is relatively easy to find reasonably priced hotels within Honolulu. Waikiki is certainly not a cheap place to stay, although does feature some of Honolulu's most impressive hotels and resorts, which tend to line the main beachfront artery, Kalakaua Avenue. 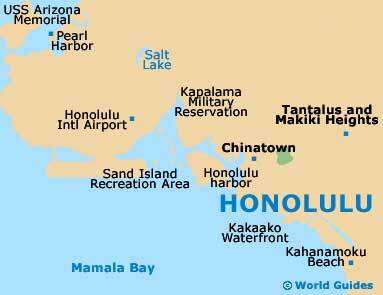 There is also a choice of lodging close to Honolulu International Airport (HNL), which is only 4 miles / 6 km to the west of the city itself. Hotels within minutes of the airport include Honolulu Airport Hotel and also the Best Western Plaza, both of which stand on the Nimitz Highway, less than 1 mile / 1.5 km from the terminal buildings. There is a wide selection of budget hotels and accommodation options in Honolulu and these are particularly concentrated around Kuhio Avenue, Waiwai Loop and Kapahulu Avenue. Hotels include The Aston Waikiki Grand Hotel, the Continental Surf Hotel and The Hawaii Polo Inn Hotel. Further budget backpacking and cheap lodging options in Honolulu include hostels and also camping grounds nearby. Mid-range hotels and accommodation options are widespread in Honolulu and include many chain hotels and popular hotel brands. Some of the most popular mid-range lodging areas in Honolulu are located around Kuhio Avenue and Lewers Street. Hotels include The Aqua Bamboo and Spa Hotel, the Aston Waikiki Circle Hotel and The Aston Waikiki Joy Hotel. 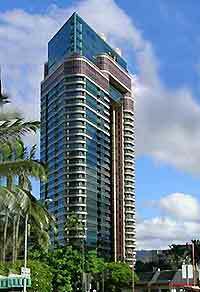 Condos and apartments can provide particularly good value for families, with Ilikai condos being especially popular and enjoying a convenient setting, alongside the Hilton Hawaiian Village and next to Waikiki Beach itself. Mid-range hotels in Honolulu provide particularly good value for money and feature excellent facilities and modern standards of lodging. Guesthouses and bed and breakfast accommodation in Honolulu HI varies greatly and the best indication of facilities available at Honolulu guesthouses is usually the price. A number of options are always available at luxury hotels in Honolulu, including suites with exceptional views, apartments and butler services. 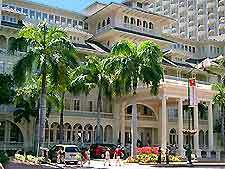 Luxury hotels in Honolulu are situated in Atkinson Drive, Ala Moana Boulevard, Kalakaua Avenue and Holomoana Street. Hotels include the Hawaii Prince Hotel Waikiki, the Renaissance Ilikai Waikiki Hotel and The W Honolulu - Diamond Head Hotel. 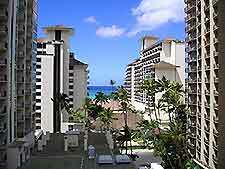 There is a wide variety of hotels in Honolulu that offer special Internet rates and discounts when booked online. Hotel reservations in Honolulu are often required several weeks in advance during the peak season and booking and reserving accommodation online can be an extremely convenient way to reserve hotel rooms in Honolulu and Hawaii. Online hotels often include booking telephone numbers in the event of any difficulties, or email addresses for questions about specific Honolulu hotels.